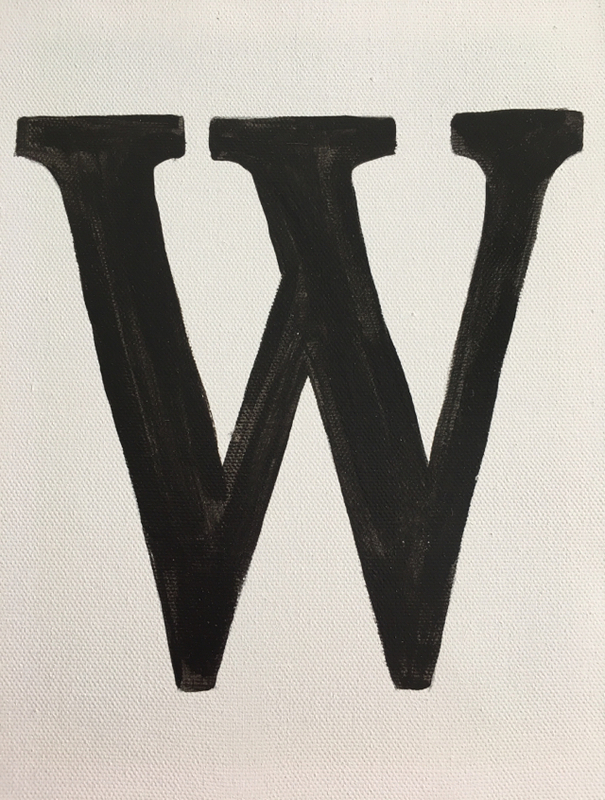 A few weeks ago, I posted my new W piece on Instagram. I adored it and couldn't wait to show off how perfectly it fit into that space. 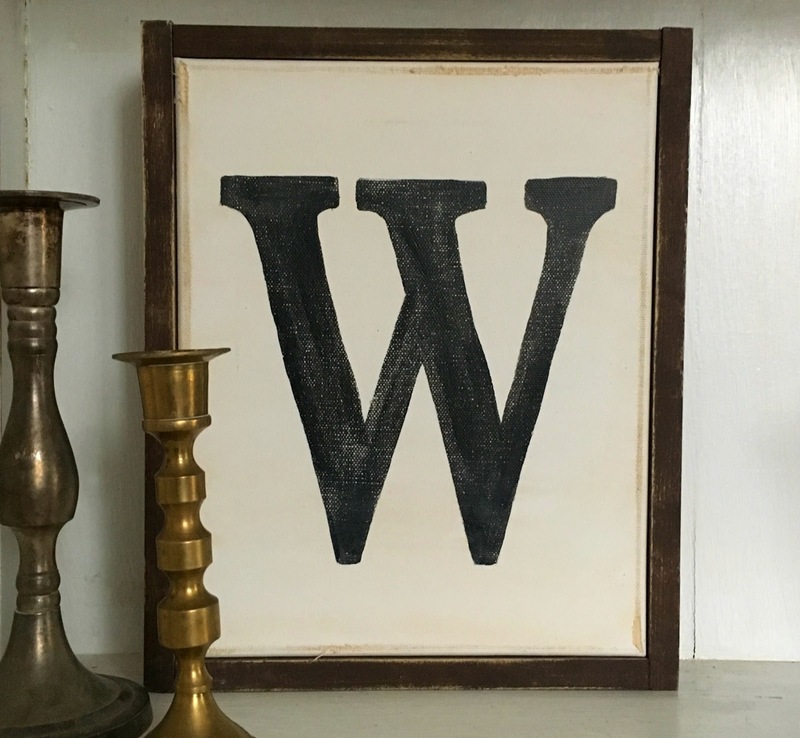 I also may or may not have confessed how many W letter pieces I had in my house. Since then, I've had several requests for a how-to. Of course! 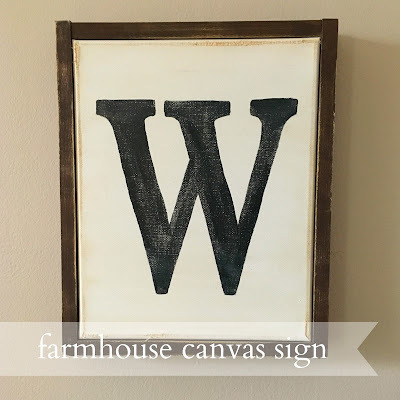 Because is there anything better than the clean, simple farmhouse look? Are there people left in the world that don't love Fixer Upper's Chip and Joanna Gaines? I think not. 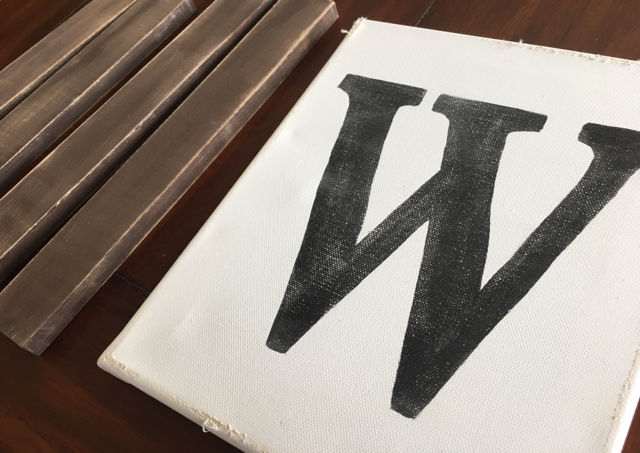 So today's project is for a fun, custom piece that you can create yourself, without dropping a huge amount of cash at Waco's Magnolia Market. 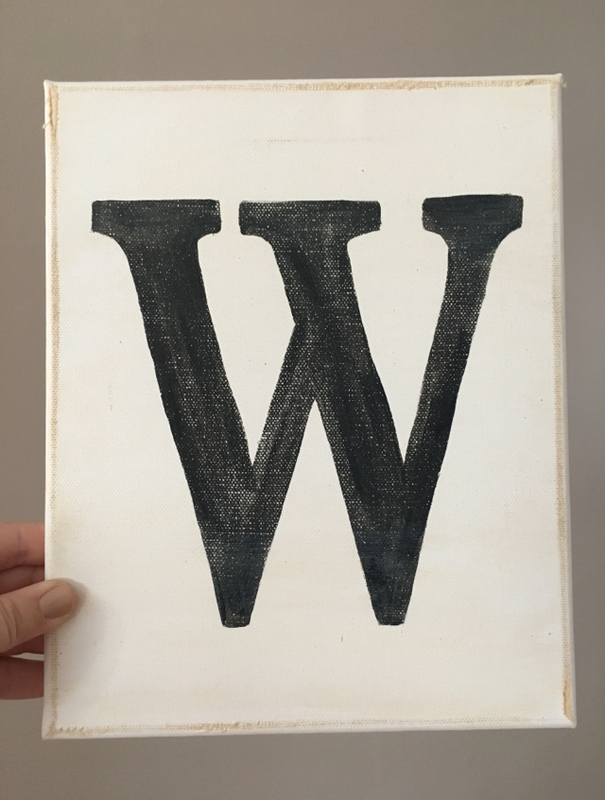 This tiny W today is no comparison to the oversized letter I created originally, but that's the beauty of this project. 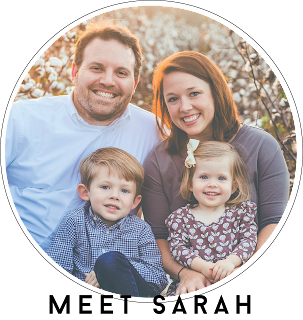 Create whatever size and print design you want! Big, small, simple, complex - do your thing! 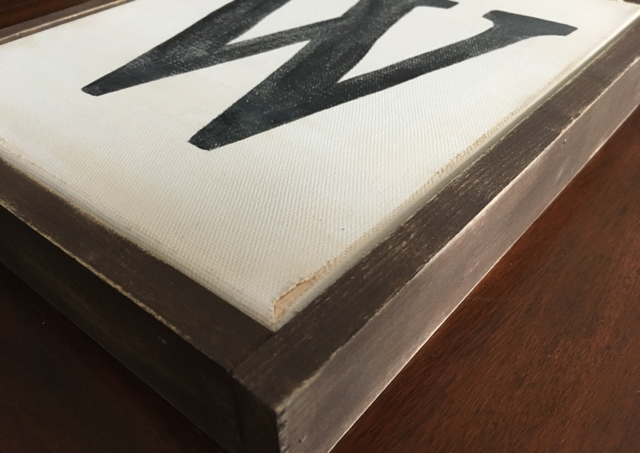 Or snag a tiny canvas like this to get your feet wet before you dive into a tougher design. *I snagged my trim wood from the lumber department at Lowe's. Look for smaller cuts section and you'll find some 2' and 4' length, 2" by 1/2". Just snag however much you need to cover all four sides. You might even consider asking them to cut it down to the right size for you! 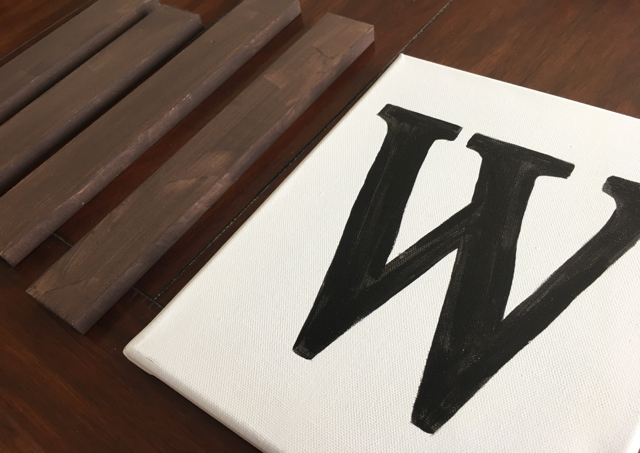 If you're cutting the wood at home, just lay the wood around your canvas and trim down the pieces to outline it. 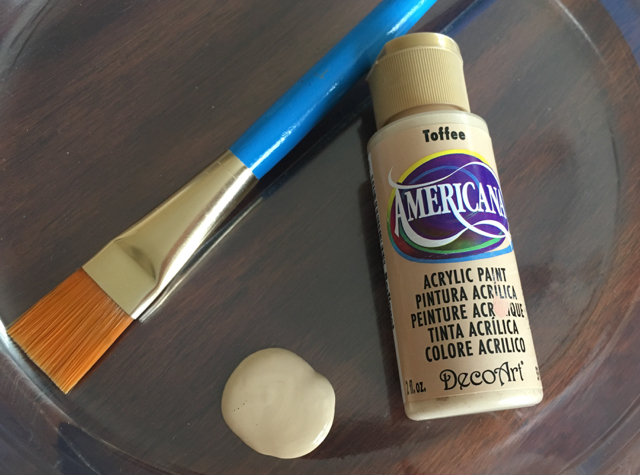 I keep basic paint supplies and colors in my craft stash. 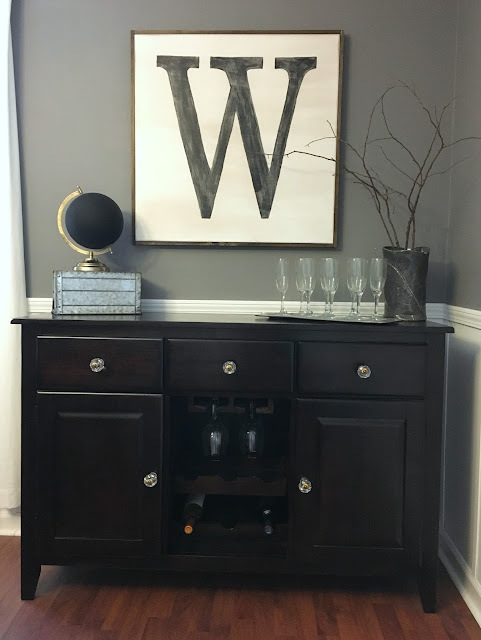 And since my hubby has a sander/sandpaper in the garage, all I had to nab for this one was a canvas and the wood trim. 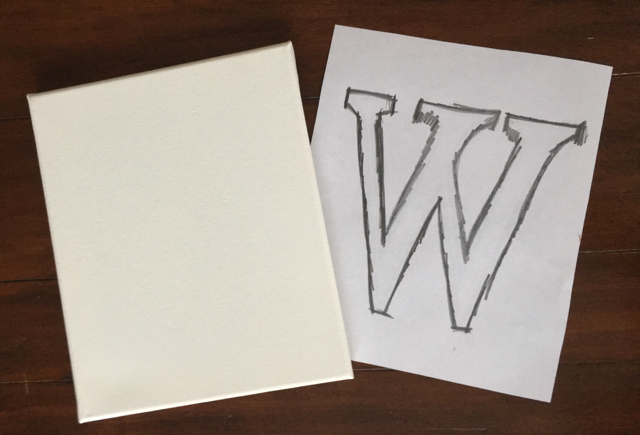 I'm doing an 8x10 this go-around (2 canvases for $6 at Hobby Lobby). That puts me at around $7 for this project! You'll start by deciding on your design! The simpler the design, the quicker and easier to execute. 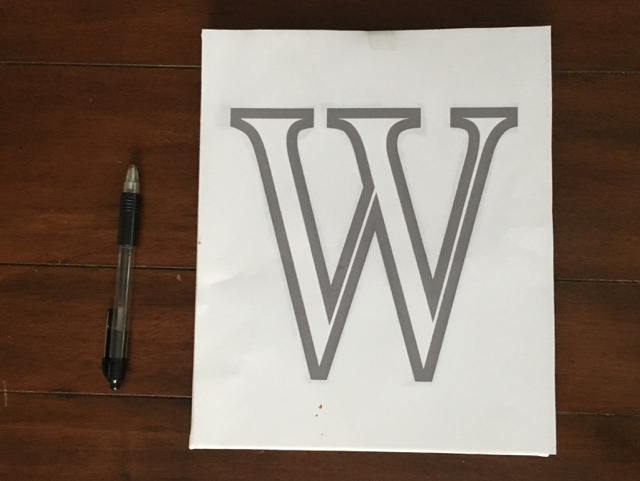 This W (and my larger one) were both fast projects. My next piece (a longer Bible verse) will take a little more time because of the detail and number of small letters. Design your artwork on the computer and make sure it's completely scaled to size. 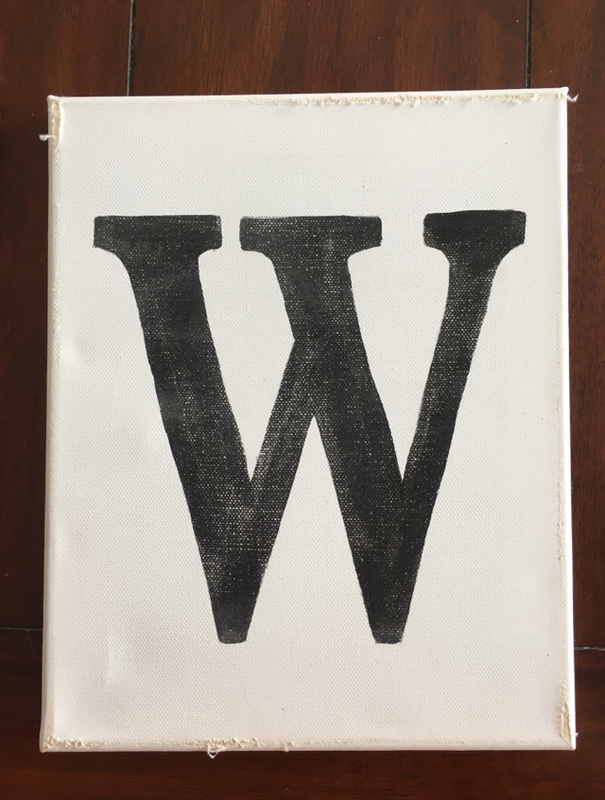 This is pretty simple for an 8x10 - draw an 8x10 rectangle and put my W inside. 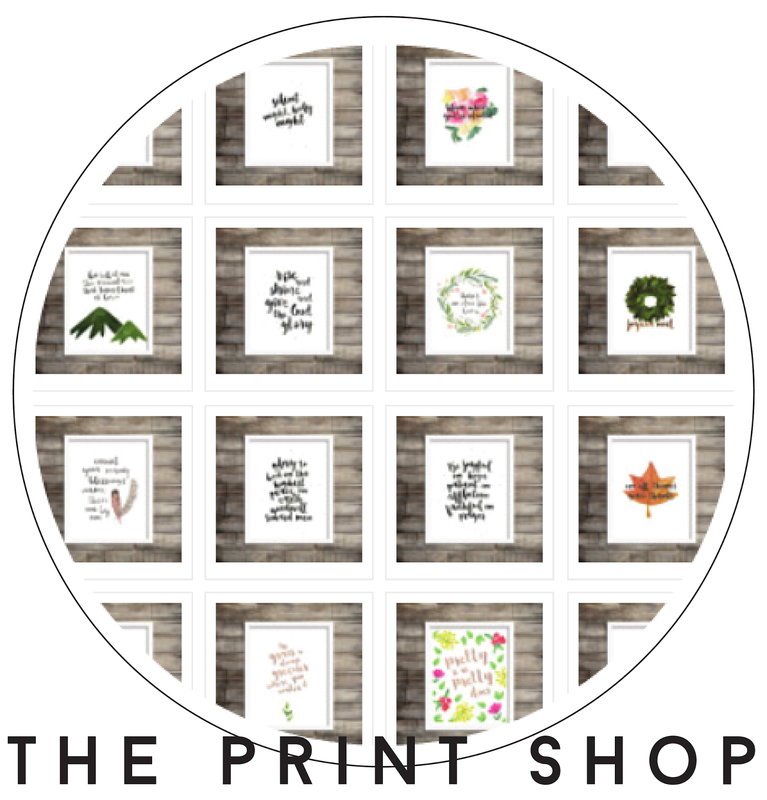 For larger pieces, I set my art board at the exact size of my canvas and created my design, but printing was a bit different since it was larger than a standard sheet of paper. I printed sections of my design out at a time and taped them together. This does not need to be pretty! 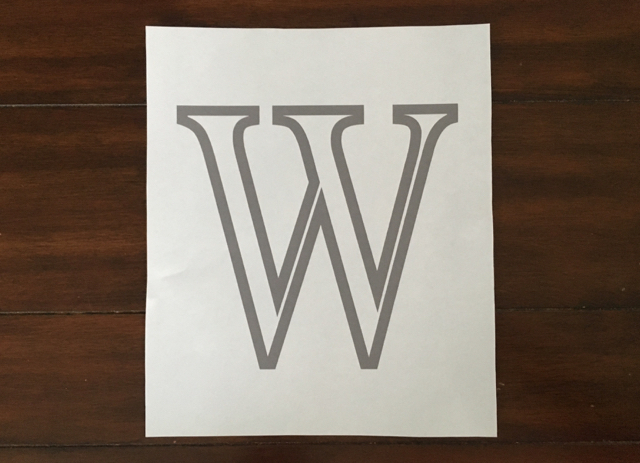 So feel free to conserve ink (see how I printed only the outline in a pale grey below) and patch things together! The design simply serves as a pattern to trace! 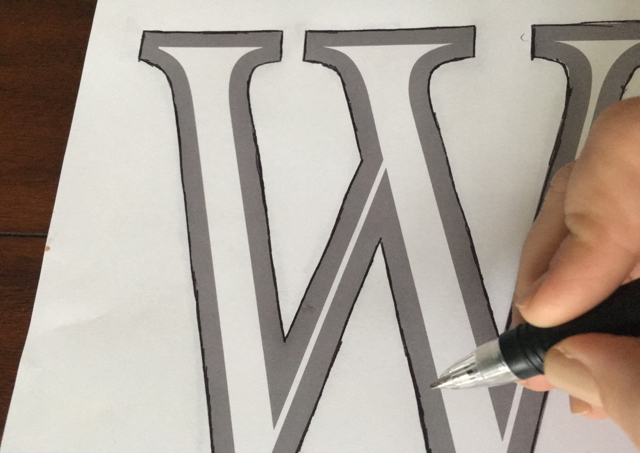 Once you have your design ready to go, flip over the sheet and rub over the outline of your design with a pencil. This is the same old tracing trick I've used in projects time and time again. 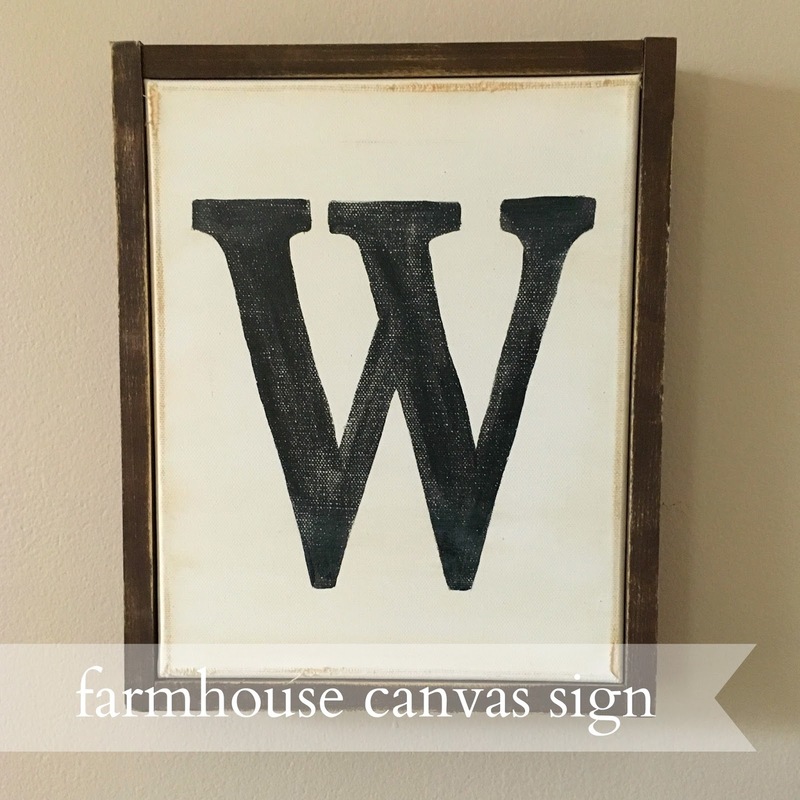 When the back is done, place your design down on the canvas, right side up. Secure it with a couple of pieces of tape to keep it from sliding. 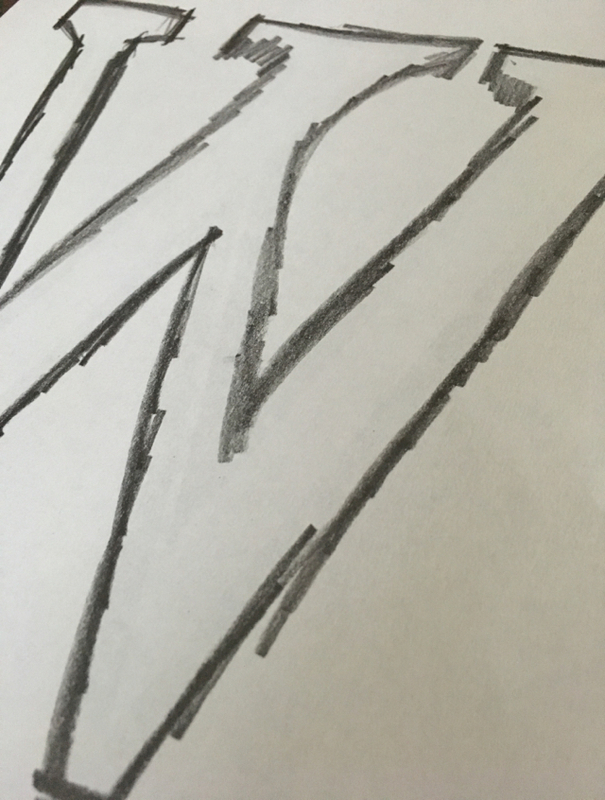 Then trace over the outline of your design with a pen - directly onto your pattern sheet. The pressure of the pen onto the canvas will transfer that lead on the backside right to your canvas! 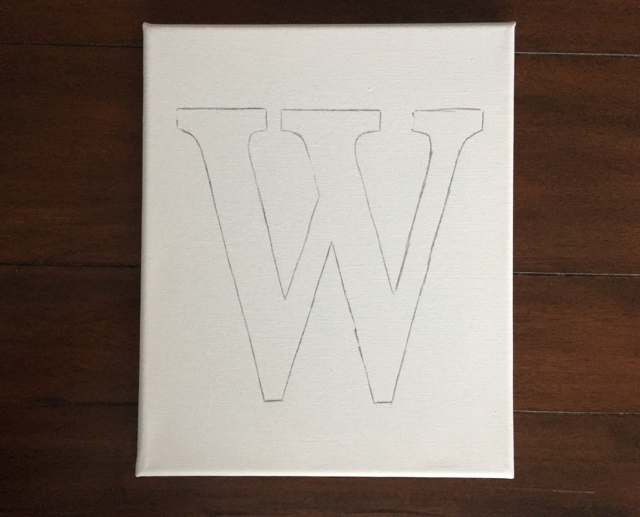 The end result should be the perfect outline on your canvas! When the outline is complete, you're ready to fill it in with paint! I like to think of this step as a subpar job. 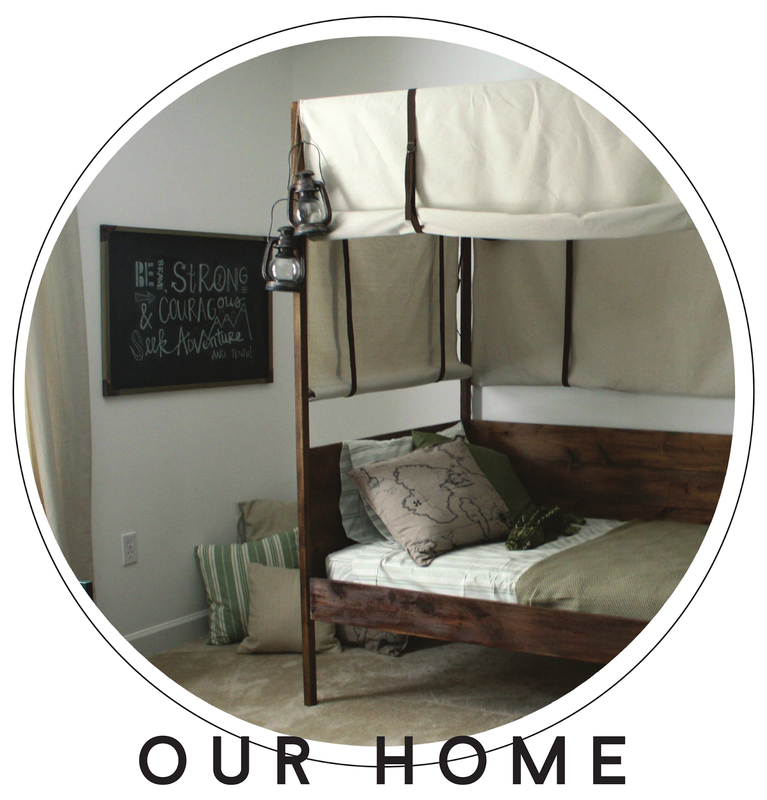 Remember that a farmhouse look is a little aged and shabby. I don't want my paint to be perfectly drawn or completely filled it. So don't stress over getting it just right. 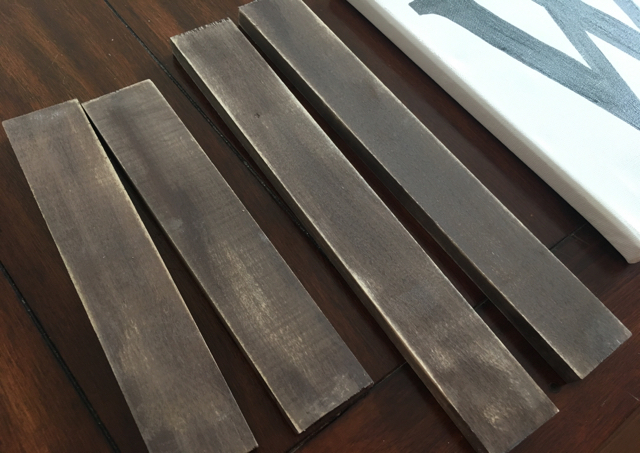 While you've got the paintbrushes out, go ahead and give your trim pieces a coat of the brown. Again, it doesn't have to be perfect and filled in. Painting completed? Now let's rough it up! Grab your sander (or sandpaper) and take to the canvas. Some sanding onto the design should dull down the painted area. Tackling the corners and edges should even pull up a bit of the canvas to reveal the wood underneath. Work here until you're happy with the end result. Then give a little elbow grease to the trim pieces so they look aged as well. It might sound intimidating, but with a power sander, this step takes me less than five minutes and makes a world of difference. The last step for your design is to glaze the canvas. For me, the clean white canvas looks a little too bright, nice and new. So I mixed a dab of cream colored paint with water for a glaze. 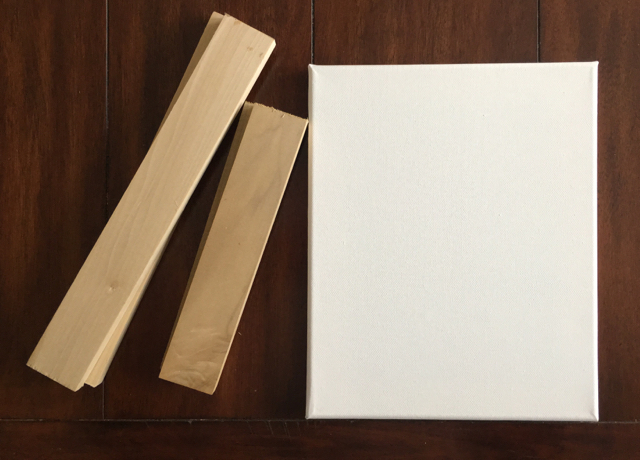 Brush this super runny paint horizontally onto your canvas. Wait 20 seconds or so and then gently wipe it off with a paper towel. 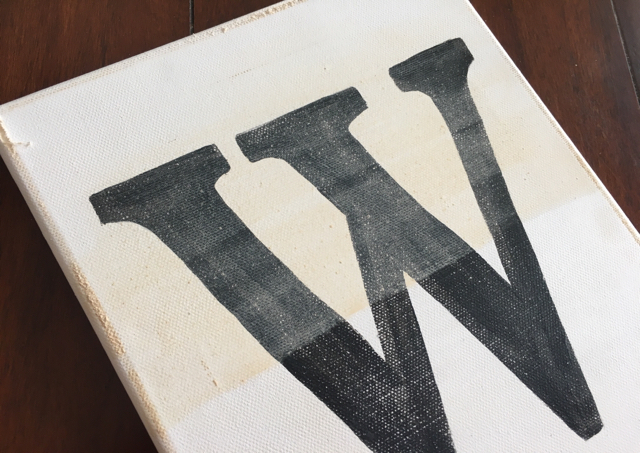 The glaze paint should show well on the distressed portions of your canvas and give some aged texture to the rest of it. You can apply and wipe off until you get the look you want. Its tricky to show this slight difference in photos but you'll definitely notice it in person. Use your own judgement! Last, we'll add the frame! To be completely honest, I handed this off to J.B. 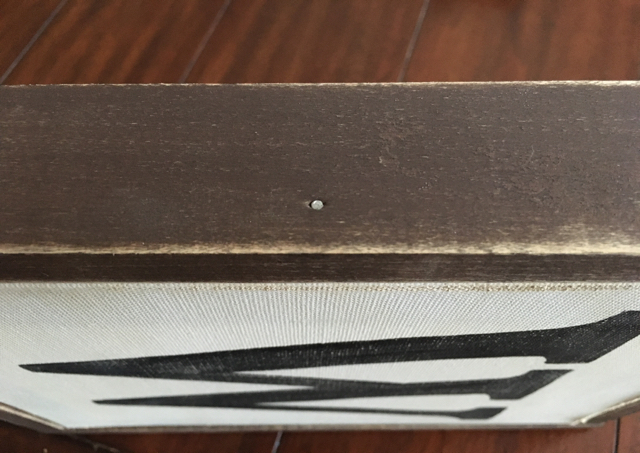 But he applied a little bit of wood glue and then used a few small finishing nails to hammer the sides directly into the canvas on each side. 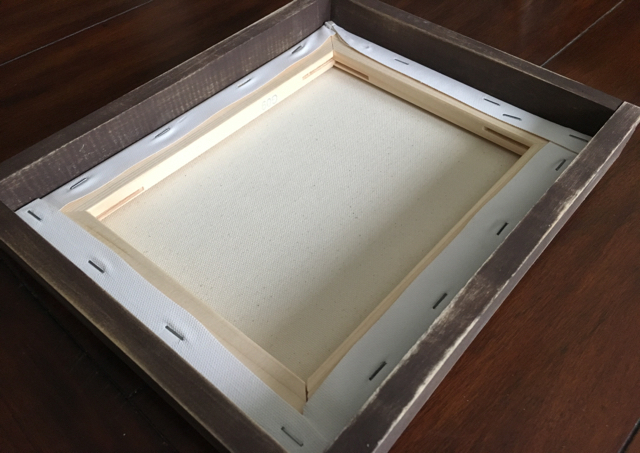 I like for my canvas to sit at the front of the frame and leave the lip on the backside. But I know some folks prefer it the other way around. Do your own thing here. Happy with my finished product! This design was a simple one. Now I'm ready to move on to a big bad design with oh so many letters! I like to think Joanna would be proud!